On Wednesday's Countdown show, MSNBC host Keith Olbermann used his regular "Quick Comment" segment to lecture Florida Republican Senate candidate Marco Rubio for recently remarking that people like Olbermann "hate America" and should be traded to other countries in exchange for immigrants who love America. As the MSNBC host referred to his own great grandparents who immigrated to America "for its opportunity and its freedom," Olbermann charged that they had come to this country to escape people like Rubio: "Mr. Rubio, I am the great grandson of immigrants, as you are the son of immigrants, who came to this country for its opportunity and its freedom. And I know one thing for sure: my ancestors and yours were trying to get away from people like you." 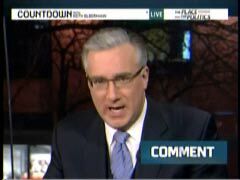 Notably, just over a year ago on the March 24, 2009, Countdown show, Olbermann seemed to express a negative view of American "values" generally when he mocked the name of Gary Bauer's American Values organization as sounding like a "discount septic tank operation." Olbermann: "Gary Bauer, former presidential candidate, former Reagan domestic policy adviser and now president of American Values which, despite the name, is not a discount septic tank operation, writing at Politico a mere two months after the last of dozens of conflicting Pentagon reports suggested with almost no verification that 61 former Gitmo detainees had been identified as returning to terrorism." But what I would never claim about you is that you do not love this country. ... when you question whether or not I love this country, you have crossed a line. You have inadvertently revealed that you don`t see those with other viewpoints as merely disagreeing with you. You have inadvertently revealed that you dismiss them as not loving this country. This, in turn, proves that if you are elected to office, you will not in the slightest be representing, nor even defending, the people of your state who did not vote for you. And that, perhaps, is the greatest crime against this country of which any politician can be guilty. KEITH OLBERMANN: First, tonight`s "Quick Comment." Mark Rubio, the Tea Party candidate for the Republican nomination for the Senate from Florida, has yet to be mistaken for one of the bright young lights of American politics. Mr. Rubio gave a speech today in West Palm Beach at which he endorsed offshore drilling, condemned amnesty to illegal immigrants, and, according to the Palm Beach Post, closed with a thought he said originated on the Glenn Beck Show. No, he did not start weeping, not even speaking in tongues. He said, regarding immigration, quote, "There are millions of people in America that hate our country, so why can`t we just do a trade? We`ll send you Sean Penn, Jeanine Garofalo and Keith Olbermann, and you can send us people that actually love this country and want to help us build it." Mr. Rubio, you have long behaved like a teenager who has borrowed his father`s suit. I think you don`t understand this country. I think you imperil this country. I think your stupidity is an indictment of the education system in this country. And I`m sure you feel exactly the same way about me. But what I would never claim about you is that you do not love this country. I would never even claim that in your own way, you have not believed you have tried to build it. You have the right to criticize anything you want about me, or anybody else with whom you disagree politically. But when you question whether or not I love this country, you have crossed a line. You have inadvertently revealed that you don`t see those with other viewpoints as merely disagreeing with you. You have inadvertently revealed that you dismiss them as not loving this country. This, in turn, proves that if you are elected to office, you will not in the slightest be representing, nor even defending, the people of your state who did not vote for you. And that, perhaps, is the greatest crime against this country of which any politician can be guilty. Mr. Rubio, I am the great grandson of immigrants, as you are the son of immigrants, who came to this country for its opportunity and its freedom. And I know one thing for sure: my ancestors and yours were trying to get away from people like you.